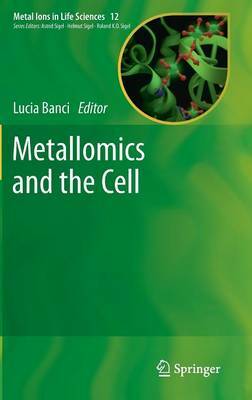 Metallomics and the Cell provides in an authoritative and timely manner in 16 stimulating chapters, written by 37 internationally recognized experts from 9 nations, and supported by more than 3000 references, several tables, and 110 illustrations, mostly in color, a most up-to-date view of the "metallomes" which, as defined in the "omics" world, describe the entire set of biomolecules that interact with or are affected by each metal ion. The most relevant tools for visualizing metal ions in the cell and the most suitable bioinformatic tools for browsing genomes to identify metal-binding proteins are also presented. Thus, MILS-12 is of relevance for structural and systems biology, inorganic biological chemistry, genetics, medicine, diagnostics, as well as teaching, etc. "Members of our labs swiftly read the volume and scoured the chapters covering the metals relevant to each of their respective research projects. Everyone found gems of insight of value to their special interests" & "Labs working on Metals in Biology need a copy of Metallomics and the Cell and their numbers should grow"
"this is a nice book that compiles the most important advances in metallomics from cellular and systems biology points of view. It provided convincing evidences that research on metallomics deserves further attention fromthe !eld of both chemistry and biology. It is amust for all researchers in the !eld of biological inorganic chemistry, and a useful resource for undergraduate teaching"